Rehabilitation creates 2 to 5 times as many jobs as new construction. This is vital, as many older buildings are located in areas of high unemployment. In the 12 years since Virginia's State Rehabilitation Tax Credit program's inception, more than 1,300 projects have qualified for the credit, resulting in nearly $1.5 billion in expenditures, much of which is pumped back into local economies. Click on the links at the left for specific guidlines for home and business owners, developers, and communities. Download reports and brochures to help you save money on the left under "relevant resources." 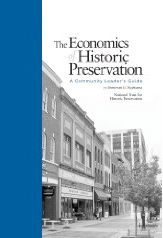 See below for a link to the Secretary of the Interior's ten standards for rehabilitating historic buildings.